Since 2009 we supply the most demanding customers with Japanese quality high-end Fujinon night vision binoculars. The binoculars are unique because of the changeable eye pieces. During the day you use the day oculars and at night you change these for the night vision ones. Equipped with best-of-class Photonis image intensifier tubes. You can expect meticulous craftsmanship, field flattener lenses, multiple coatings and a very ruggedized rubber armoured housing. At MSS Defence we also supply military tripods, custom hard cases and all other accessories that you might need. The 8x50 FMTR D/N is the perfect high-powered night vision binocular for mobile applications. As a true binocular it offers three-dimensional viewing over a range of several hundred meters. Its optics are corrected into the near-infrared range and offer a much better resolved and more relaxing viewing than conventional night vision monoculars. With Photonis Generation II+, XD4 or XR5 autogating image intensifiers, especially redesigned to match the optical characteristics of Fujinon night vision devices. This yields a sharp image over the entire field-of-view. The 8x50 FMTR D/N is shock-protected and waterproof/dustproof according to U.S. military specifications. A pair of additional 8x day eyepieces is supplied as a standard accessory. Like all other Fujinon night vision binoculars it is offered to governmental or professional security customers only. New: The Fujinon 8x50 FMTR D/N can be supplied with the new Photonis ONXY black & white image intensifiers which offer a convenient high-contrast image for extended observations. 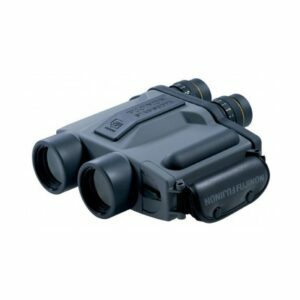 These binoculars are ideal for any harsh security, military or maritime use. In use with various defence organisations, including United Nations (UN) peace keeping units. These binoculars are accepted by the UN for contingency owned equipment. Comes with PELI hardcase with custom foam interior, neckstrap, CR123 batteries and operator manual. These binocualars can be supplied with an optional tripod adaptor and lightweight carbon or standard military tripod. With these options the 8x50 FMTR is very suitable for use by forward observer officers (MFC, FOO, FAC, TACP) in static observation posts (OP). Note: This is a dual use good, EU export regulations apply. Stabiscopes are used for professional observation when strong motion and vibration affect viewing. They work perfectly on helicopters, boats and in moving cars. A high-speed gyroscopic motor effectively stabilises the image and provides high-resolution viewing with no jittering even under extreme conditions. The extremely tough body protect against impacts and scratching. In addition, all models are completely waterproof and comfortable in daily use. Provided with Photonis Generation XD4 or XR5 image intensifiers only, the S12x40 Stabiscope D/N are especially redesigned to match the optical characteristics of Fujinon night vision devices. This yields a sharp image over the entire field-of-view. New: The Fujinon S12x40 Stabiscope D/N can be supplied with the new Photonis ONXY black & white image intensifiers which offer a convenient high-contrast image for extended observations. Note: This is a dual use product, EU export regulations apply. The Fujinon 25x150 ED D/N is the perfect high-powered night vision binocular for static applications. The world´s largest night vision binocular offers an observation range of more than 30km depending on requirements and location. 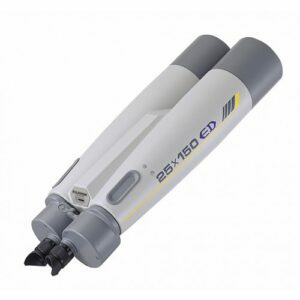 Equipped with state-of-the art Photonis XD4 or XR5 image intensifiers the powerful 150mm lenses and the 25x magnification eyepieces allow high-resolution observations under any illumination conditions. The standard equipment includes additional 25x eyepieces for day observations, optionally a set of 40x eyepieces is available, too. The 25x150 ED D/N complies with U.S. military specifications in terms of water- and dustproofness. New: The Fujinon 25x150 ED D/N can be supplied with the new Photonis ONXY black & white image intensifiers which offer a convenient high-contrast image for extended observations. Note: this is dual use good, EU export regulations apply.